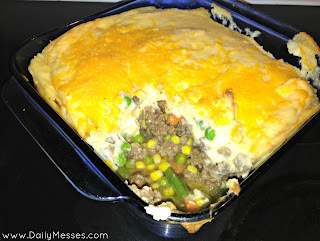 This Shepherd's Pie is easy and super filling! Prep Time 10 min., Total time 30 min. Serves 6. Optional: This recipe is produces a mild flavored shepherd's pie. I like to add some garlic and black pepper to spice up the meat mixture. 1. Preheat oven to 375 degrees F. In a large skillet, brown the ground beef. Drain any grease. 2. Mix mashed potatoes, 1/2 cup shredded cheese, garlic, and cream cheese until well blended. 3. Add the vegetables and gravy to the meat. Stir. 4. Place meat/vegetable mix in a 9 inch square baking dish. 5. Cover with potato mixture and sprinkle the rest of the cheese on top. 6. Bake 20 minutes (or until heated all the way through).